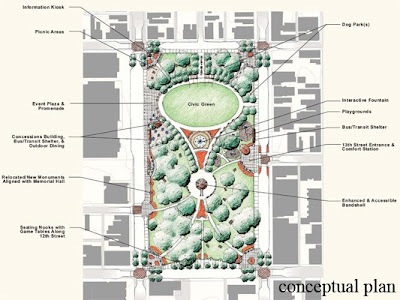 Washington Park offers a great opportunity for Over-the-Rhine. It is a historic park that has been owned, by the City, since 1855. The park boasts Civil War monuments, a historic bandstand, and some beautifully mature trees. On the other hand the park has been plagued with perceived safety issues and an overall lack of investment in the surrounding area. This is rapidly changing with the massive investment from 3CDC and others. New residents, businesses, and a new School of Creative and Performing Arts are all offering the park and the neighborhood a fresh chance at new life. Washington Park Elementary once sat on the northern most portion of Washington Park and essentially cut Washington Park off from its northern neighbors. The demolition, of Washington Park Elementary, now offers an opportunity to expand the park where the school once sat. At the same time it will allow for a potential solution to another problem for new residents, businesses, and established destinations in the area (i.e. Music Hall, Memorial Hall, etc) – parking. The expansion plan right now is to build a garage, underneath the expanded park, that would create 600-700 parking spaces. The total project cost is pegged around $25-million and a time line for completion will be created following more community input on the final plan. This is all made possible by a recent agreement between Cincinnati Public Schools and the Cincinnati Park Board with 3CDC. CPS has agreed to permanently transfer the title for the former school site to the Park Board.